The Estonian Air Force has taken delivery of the first ETP 8×8 military truck from Sisu Defence Oy. The truck will serve as platform for the Air Force’s Ground Master 403 three-dimensional (3D) air defence radar system. The delivery follows an €8.5m contract signed between the company and ThalesRaytheon Systems (TRS) in July 2010. The trucks form part of the Ground Master air surveillance system package that TRS is providing to the Estonian Ministry of Defence. Equipped with an integrated hydraulic stabiliser system, the 8×8 trucks are also capable of maintaining the radar in level position even when the vehicle is inclined or moving on uneven surface. A2045 4×4 trucks will also be delivered to the Estonian Air Force as part of the contract. Two Ground Master 403 radars were ordered by the Estonian MoD in March 2009 to help increase defence of its vital military assets and expeditionary forces through detection of a wide range of unmanned aerial vehicles (UAVs), missiles, mortars and rockets from very low to high altitudes. The radars have also been purchased by Canada, Finland, Germany, Malaysia and Slovenia. Powered by a Caterpillar C 13 engine, the Sisu E13TP 8×8 is a high-mobility tactical military truck used as a mobile, heavily protected tactical vehicle for international peacekeeping missions and rapid deployment of forces. The vehicles are currently operational with Lithuanian and Finnish Defence Forces as radar carriers, missile launchers, fire fighting, as well as cargo and recovery vehicles transporters in UN and Nato led operations in Lebanon and Afghanistan. 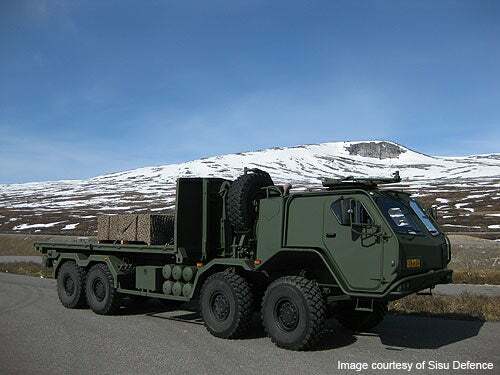 Image: The Sisu E13TP 8×8 high-mobility tactical military truck. Photo: courtesy of Sisu Defence.